Ian Stuart Ashby (# 45 in the list of senior men to represent Great Britain) was born in Herne Bay on 20th July 1966. It was Ashby's next door neighbour, Jim Lipyeat, that first introduced him to roller speed skating. Lipyeat had himself been One Mile British Champion back in 1959 and was now coaching his two young daughters, Denize and Helen. Denize would later go on to be a multiple British Champion as well as an accomplished international and European bronze medallist. 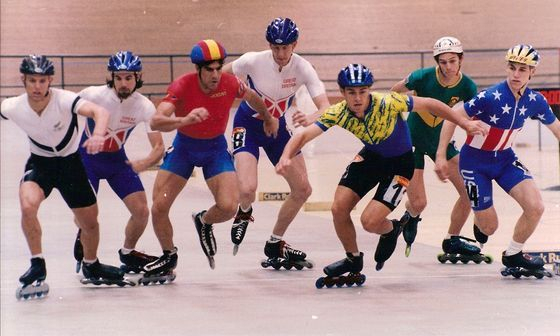 Although the NSA had been providing races for junior skaters aged between 11 and 15 for some years, the 6 to 10 year age group was relatively new. On 23rd January 1977 a ten year old Ian Ashby skating for the recently rejuvenated Herne Bay United club took part in his first race - an 800 metres handicap run by the NSA. The following season Herne Bay United became the more widely known Herne Bay Flyers. In July of the 1978 season Ashby took his first British Championship medal, a silver behind fellow club mate Rohan Harlow in the 7-11 years 500 metres on Southampton. Throughout the next few years as a junior Ashby featured consistently in the top three. For this he was rewarded in 1981 with a place on the Junior British Team that took part in the Junior European Championships in Pamplona, Spain. Ashby featured in all eight distances, with no fewer than six top ten finishes, the highest of which was seventh on the road in the 5000 metres. Back in those days the British federation limited the distances that juniors were allowed to skate to 5000 metres. This meant that Ashby and his fellow team mates ridiculously had to watch from the side-lines whilst the other nations competed in the 10000 metres on both road and track circuits. (This regulation has since been removed from the British rule book). On 20th June 1982, just a month before his 16th birthday, Ashby took his first British Championship gold medal in the 11-15 years 3000 metres on Tatem Park. He followed that up with a second title two weeks later on Palmer Park, Reading, when he also won the 11-15 years 500 metres. By 1983 Herne Bay Flyers had rapidly risen to being by far the largest and most successful club in the country. Besides Ashby there were other junior internationals such as Suzanne Jackson, Dawn Birch, Ashley Harlow and Paul Turner - not to mention senior internationals Denize Lipyeat, Rohan Harlow, John Quinney and David Jackson. The club was in its heyday and was sweeping all before it. In fact Ashby's own father, Derek, also got in on the act and was regularly seen in the centre of a race track, usually on the lap board, doing his bit for the sport whilst also quietly, and proudly, supporting his son. Sadly, Derek passed away in 2010. Having turned senior on his 16th birthday Ashby was always there or thereabouts in races. 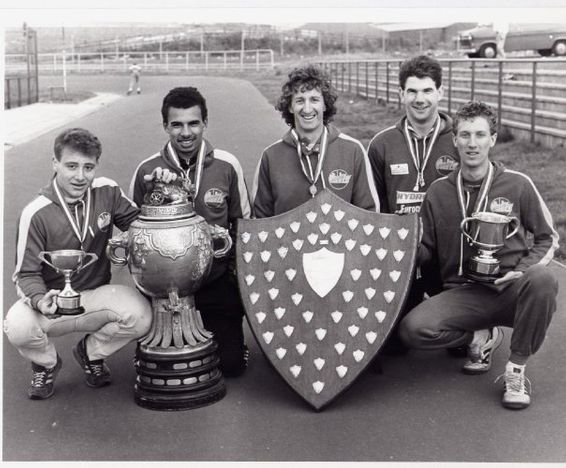 On Tatem Park on 10th July 1983 during the British Championships he and his fellow Herne Bay team mates, John Quinney, David Jackson and Jeff Finlayson, smashed the British record for the 5000 metres 4-man relay and won the event by over a lap on the second placed team. Ashby would also take bronze in the Jesson Cup 1500 metres open handicap Championship on the same day, but the best was yet to come. Two weeks later, again on Tatem Park, Ashby won his first senior British title by becoming the first winner of the 300 metres time trial and in so doing set a new British Record with a time of 27.84 seconds. The time was also the then fastest recorded time for the distance globally, so not only was Ashby officially now the fastest man in Britain, he was "unofficially" the fastest man in the world! It was an achievement that could not be overlooked. In 1984 the British Championships were on the brand new Birmingham Wheels track. In fact, it was the inaugural event. Ashby set out to retain his 300 metres title but failed to do so by just 0.2 seconds from John E. Fry. Although he would finish second, to finish so close to Fry was an achievement in itself for a number of reasons. One being that Fry had been instrumental in getting the track built pretty much on his doorstep and had had the benefit of having trained on it to determine his preferred wheel selection well before the competition started. Another was the "equipment malfunction" that Ashby had during his first run. Shortly after running off the start it was apparent that the zip on his skinsuit had broken and Ashby felt that this had impeded his performance. The rules state that in the event of equipment failure an athlete is permitted a re-run and whilst most people would attribute the term "equipment" to mean skates, Ashby convinced the officials that the term should also extend to clothing and he was duly granted his re-run. We will never know how Ashby may have fared had the now infamous "zip incident" not happened, but it can be said that it certainly didn't help. A year on and Ashby had lost some of his form. He was now playing second fiddle to some of his team mates and some emerging names among the rank and file. The likes of Mark Tooke, Hugh Doggett and Andrew Newton were starting to make a name for themselves. These guys were not sprinters, they won on strength. They knew no other way to race other than attack. Ashby was predominantly a sprinter. He knew that in a distance race if he was still in the mix with a lap or two to go he was in with a shout. 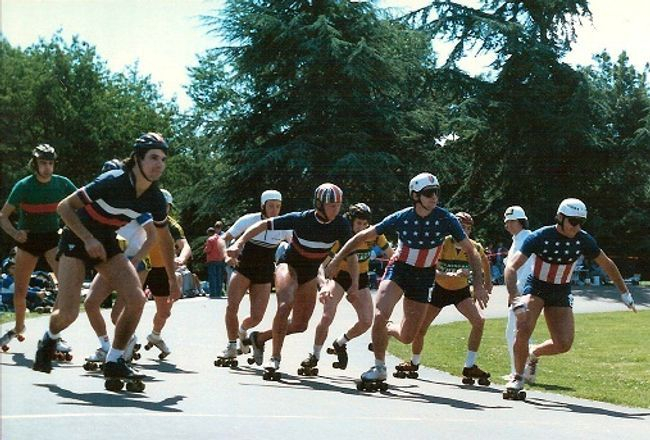 Unfortunately, sprint distances were few and far between and the days of longer distances where skaters walked round and then sprinted at the end were rapidly becoming a thing of the past. Not only did Ashby need to do something different with his skating but he was also finding it difficult to find much needed work in or around Herne Bay which wasn't helping his cause. Then, early in 1986 an opportunity arose which potentially resolved both issues. His long time friend and skating adversary, John C. Fry, had been regularly sending Ashby the jobs pages from his local newspaper, the Birmingham Evening Mail. 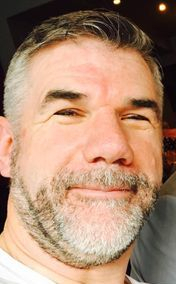 Ashby applied for and was successful in getting a job in Birmingham. This, of course, meant that not only would he have to move to the Midlands but it was an ideal opportunity to join the Birmingham Wheels club and be coached by GB international and former double European sprint Champion, John E. Fry. Throughout the 1985-86 season Ashby continued to skate for Herne Bay Flyers and had made it known he would join Birmingham Wheels on October 1st, the start of the 1986-87 season. The British Championship time trials were scheduled to be held on his home track in Westbrook Lane, Herne Bay on 20th July, Ashby's 20th birthday. Ashby had been training hard and was looking forward to the attempt at regaining his title he won back in 1983. The circumstances surrounding these Championsips were almost a mirror image of the 1984 event. Westbrook Lane was a new track with only one race having previously been held on it but this time it was Ashby who had the advantage in terms of training and access. Everything seemed to be pointing to an Ashby victory. However, throughout the competition there had been problems with the timing equipment. When Ashby's turn came he posted the best time of the day and with only three skaters to go was almost guaranteed a medal if not the title itself. Of the three skaters left only John E. Fry was realistically capable of beating him. Fry was next to go immediately after Ashby, but once again there was a problem with the timing equipment and Fry's time was not recorded. Protestations followed and the NSA took the decision that the event should be postponed and re-run at a later date. It was an unexpected bitter blow to Ashby, but one that he would recover from. As predicted on 1st October 1986 Ashby switched from Herne Bay Flyers to Birmingham Wheels and started a new chapter in his skating career. The re-run for the 1986 time trial British Championships was now scheduled for October 26th on Tatem Park. Since the first British Championship in 1894 this was the first time an event had been postponed to the following season. Further, Ashby's switch of clubs made him unique in so far as he started the event back in July competing for one club and finished it in the colours of another. As it was Ashby didn't care much. He took to the London track and posted a time of 27.55 seconds - a time faster than his "unofficial" world record of three years earlier. Fry, next up, was over a second slower. Ashby was once more the undisputed fastest man in Britain. Ashby's training with his new club was soon paying dividends. Early in 1987 he was the shock winner of the Wisbech Half Marathon and although he never won an individual gold medal in the British Championships that year he did place in the 300 metres, 1500 metres and 3000 metres Southern Counties. 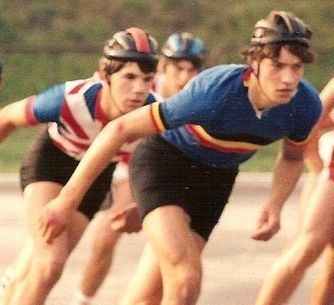 He was also a member of the Birmingham Wheels team that won the British Inter-Club Relay Championship that year too. (Incidentally, this gave Ashby five consecutive relay titles - an achievement only previously matched by three other skaters since its inception in 1923 - Bill Ross, Eddie Stumbke and Les Woodley). Once more his efforts did not go unnoticed and for a second time in his skating career he was called upon as a member of the 1987 senior British team for the European Championships in Ostend, Belgium. As 1988 approached his interest had started to wain. His training was sporadic and work was starting to play a bigger part in his life over skating. Ashby took part in just a few races that year and 1989 saw a complete sabbatical from the sport. 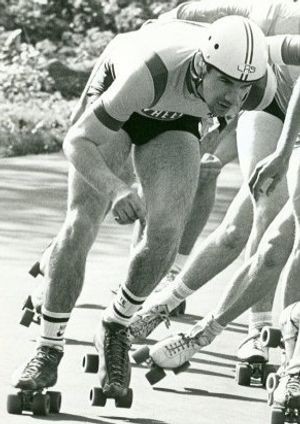 In fact over the next few years skating was very much a bit part in Ashby's life with only just an occasional appearance at race meetings, but his form was nothing like that which had been so prominent a few years previous. In 1992 a revolution was sweeping the sport of speed skating globally. Inlines were now becoming more prominent and in fact that year saw the very first World Championship event on the new type of skate. Intrigued, Ashby bought himself a pair and started to once more take an interest. Throughout the winter of 1992 he was back in training with his old Birmingham Wheels club mates. Still only 26 years old he still had time to once again make his mark on British speed skating. 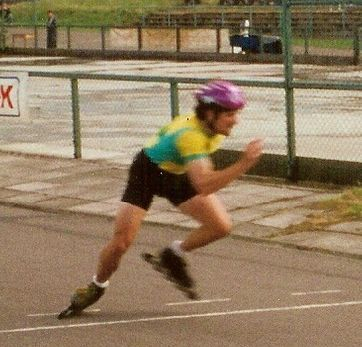 The 1993 season was a struggle for Ashby as he got to grips with a whole new skating technique. Undeterred he pushed on and by October he was again right up there with the British elite. Once more he was selected to represent Great Britain, but this time it was the World Championships. Whilst his results were not outstanding, they were no worse than any other British skater in the team that year. Sixteen years after he first set foot on a track Ian Ashby was now going to take part in his first World Championships - in Colorado Springs, USA. On his return to the UK Ashby continued to train through the winter. Although widely recognised as a sprinter his training was geared for one thing - to become the first British Champion in a 300 metres time trial on inlines. Britain had been a little behind the times in introducing inlines into Championships. Despite the use of inlines having been introduced into major international competitions in 1992, Britain did not allow their use into domestic Championships until 1993, and then only in the marathon. 1994 was different. All domestic events were now declared as "open". With the advent of a Grand Prix series in Britain there was no fewer than five time trial events throughout the 1994 season. In the first one Ashby would finish second - but would then go on to win the next four, which included his goal, the 300 metres British time trial title. Not only was he the first person to win the event on inlines, but he was the first of only two people (the other being Sutton Atkins) to win the event on both types of skate, a feat that will surely never be repeated. So, eleven years after his first senior title Ashby once more secured his place in the British sprint history books. His UK sprint dominance in 1994 was undeniable - and once more he was selected for GB, this time at both European (Pamplona, Spain) and World Championships (Gujan Mestras, France). By now Ashby realised that he was probably at the highest point in his skating career that he was realistically capable of achieving. For him, the thought of another hard winter of training was not so appealing and he began to wind down. Whilst he continued to train it was not with the intensity as before and in fact the 1995 season only saw him take to the track competitively just once. The 1995 World Championships were due to be held late in November in Perth, Australia and due to the distance and cost many of the British skaters who had been selected for the European Championships earlier that year, made it known that they could not afford the trip. The door was open for Ashby to have one last roll of the dice and he resumed hard training. Having done just one race that year Ashby still declared himself fit for selection. Although not at his peak it was still evident that Ashby may have something to offer and was selected one last time to put on a GB skinsuit, albeit for just three events on the track. When he returned to the UK this time the writing really was on the wall. He was concentrating more on his work and personal life and he knew that both domestically and internationally the sport had moved on. In 1996 he took part in a few races at the start of the season, but by the middle of the year he knew his time was up. Fittingly, his swan song was the British Championships. On the first day of the two day event he had finished a commendable fourth in the time trial, but on the second day, 30th June, he failed to make the final of the 500 metres, having only just scraped through to the semi-final. His last race was the 5000 metres later that day. As he stepped off the Birmingham Wheels track it probably didn't occur to Ashby what he had achieved in a skating career spanning almost 20 years. Such is his modesty that he still leaves it up to others to reflect and comment on that. In August 2012 Ian Ashby left the UK to begin a new life in Australia, ironically the country that saw the end of his international skating career. If he only achieves half as much in Australia as he did in the UK, his continued success in life is almost certainly guaranteed.